“Thank you, you are doing the right thing. WE HAVE YOUR BACK. STAND TALL AND STAY THE COURSE”. Big Money (Forestar) rolls out big guns (Lawyers) to intimidate guardians (Lost Pines GCD Board) into capitulating (giving them what the want) rather than protecting our groundwater resources. We need your help to let the Board know that they are doing the right thing in protecting our groundwater and WE HAVE THEIR BACK. Ask them to please “stand tall and stay the course”. 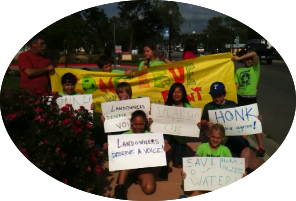 Bastrop, TX – The people of Bastrop and Lee counties gained a MAJOR VICTORY at last night’s Lost Pines Groundwater Conservation District hearings. The Board of Directors listened … and they acted on our behalf. THANK YOU Lost Pines BOARD MEMBERS! 1) LCRA’s request for 10,000 acre-feet/year was cut back 50% to 5,000 acre-feet/year except in years when the counties are in drought conditions. 2) Forestar’s request for 45,000 acre-feet/year to export was cut back 75% to 12,000 acre-feet/year. 3) Environmental Stewardship and a group of landowners were accepted for timely filing of their request for “party status” at the End Op contested case hearing to be held before the State Office of Administrative Hearings. What does “draw-down” resulting from groundwater pumping look like on a map? As you may know, the Desired Future Conditions are established in terms of the draw-down, in feet, of aquifers in Bastrop and Lee counties and throughout the District. Recently, Environmental Stewardship obtained visual images based on the Groundwater Availability Model (GAM) used by the Lost Pines Groundwater Conservation District to evaluate the impact of proposed pumping from current permit applications on the Simsboro Aquifer. Draw-down, measured in feet, is indicated on the contour lines of the maps below. Here are the results of the meetings held over the last two nights. 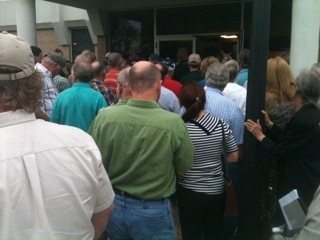 We had an overflow crowd at the Wednesday meeting which delayed the start of the hearing for about 20 minutes; we estimate 200-300 people showed up to comment. Lines of people were able to que up for comments and the combined hearing and board meeting lasted until about 10:30 p.m. The End Op Hearing on Thursday had very good citizen attendance – likely another 200-300 people – and lasted 3 1/2 hours. During the Board deliberations after the hearing we learned that Aqua Water Supply Corporation is also contesting the End Op permit application. The Board of Directors has HEARD THE VOICE OF THE PEOPLE. Both Judges were at the Wednesday night meetings … THANK YOU JUDGES PAPE and FISCHER. THE BEST VOICE OF THE PEOPLE … IS THE FACE AND TESTIMONY OF THE PEOPLE. THANK YOU FOR SHOWING UP and COMMENTING! There are several new developments we need to inform you about. Please help us spread the word. 1) There is a change in the DATE and LOCATION of the End Op hearing. 2) The Manville hearing will be held along with the regular Lost Pines Board of Directors meeting as previously announced. 3) Environmental Stewardship has provided a letter to the Board with its rationale in support of the Bastrop Commissioners Resolution. This is INSANE but there is a SANE PATH FORWARD. Yes, it is insane that the Lost Pines GCD is on the verge of permitting five and a half times (5.6) more water from the Simsboro aquifer than is available, however, Environmental Stewardship has provided a sane path forward …but it is up to you and your local elected officials to demand a sane path forward. DO NOT PERMIT MORE WATER THAN IS AVAILABLE! adequate legal findings to support an informed decision. 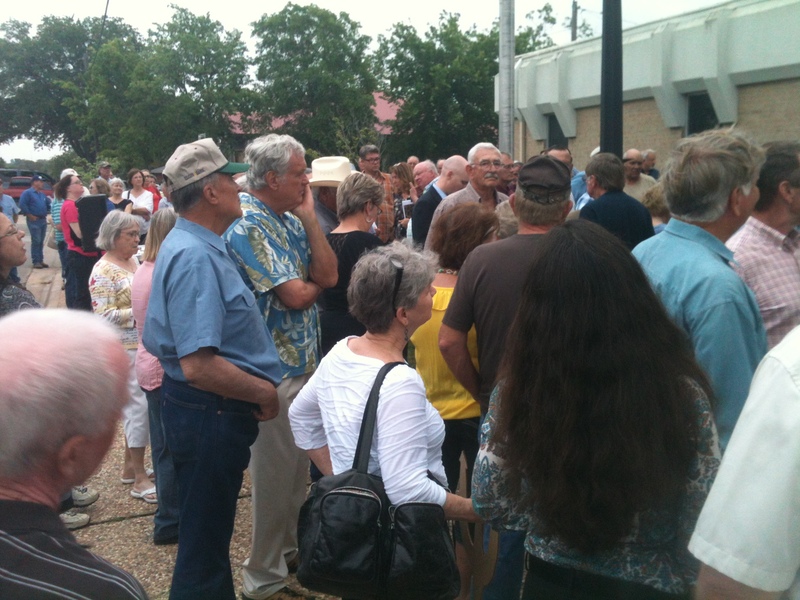 Will Lost Pines GCD Follow or Skirt the Law in their Permitting Process?